Potter County was created in 1804, carved out from a northwest section of Lycoming County. It is located midway between the eastern and western boundaries of Pennsylvania along the New York border. The county's name is a tribute to General James Potter, who served with distinction during the Revolutionary War but never set foot in the area. 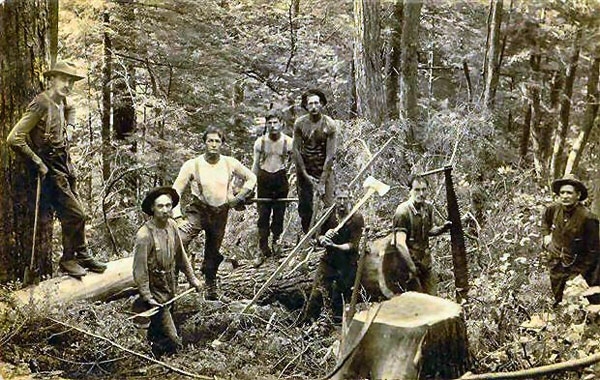 Potter County's bountiful forests proved to be the region's main attraction and economic lifeblood during a growth spree that began to subside during the first decade of the 20th century. Native Americans had passed through the forested wilderness, but had congregated in larger numbers in neighboring regions. In 1808, an east/west road across the northern part of Pennsylvania was opened, ushering in scattered settlers. They remained few in number due to the hardship of finding the bare necessities. Ultimately, Potter County's attraction to the outside world was its dense forests of magnificent white pine, hemlock and hardwoods. For decades, the principal occupation of its inhabitants was lumbering and clearing land. Many of the immigrants came from Maine and Canada. Lumber mills were built along streams with sufficient water supply to turn the saws. As more families arrived, churches and schools were built and communities were formed. Railroads were built through the forests to haul logs to the large saw mills in local communities such as Galeton, Cross Fork, Austin, Mina, and Keating Summit. Gradually, railroads replaced the swollen streams in carrying the finished lumber to larger markets on the east coast. Labor was imported, including many European immigrants, and in 1900 the population of Potter County reached its all time high of 30,621. Industrial plants were established, using wood or bark as raw materials. As the hillsides became barren, the population spiraled downward. With much of the barren timberland abandoned, its ownership reverted to the Commonwealth. Today, almost 300,000 acres, more than 40 percent of the land in Potter County, is owned by the Commonwealth. Although there are scattered manufacturing facilities and small businesses, farming and lumbering remain components of the county's economic foundation. Tourism and recreation also generate jobs and income. Much of the forest that was hacked away from 1890-1910 has returned, and a third generation is growing in some areas. Succession forests consist of a higher proportion of marketable hardwoods. Potter County has been called the roof of the Eastern United States, as headwaters of the Ohio/Mississippi rivers, Chesapeake Bay and the St. Lawrence River. The county's population descended rapidly from 1900 through 1930. There were fluctuations over the next half-century before a steady rise in the 1990s. Between 1990 and 2000, the population rose from 16,717 to 18,080. It rose even more in 2001-02. However, a recent estimate released by the U.S. Census Bureau shows a population of 16,720 as of 2008, representing a 7.5-percent decline since 2000.
meet the changing requirements and economic trends of Potter County agriculture.